Miami is one of those cities with air conditioning operating in homes sometimes around the clock. It is essential that air duct filters are replaced on a regular basis. You won’t have any trouble finding the right filter size at a local hardware store. It might even be a smart move to buy filters in bulk by the case for easy replacement. Your central AC system has a drain line that drains the condensation from the inside air condition unit. If this line gets clogged, then it could cause water damage inside the house. That’s why you should periodically drain the line and flush it out. Before you can fix any leak in your plumbing, you need to shut off your water. It’s important that you know where the shut off valve is not only for these kinds of repairs but also the case of any emergency. It’s not a bad idea to shut your water off if you going on an extended vacation. A toilet that is running is not the same as a toilet that is clogged. When water is running inside a tank, it’s usually because something is out of alignment. A quick peek inside the tank is all you would need to know what needs to be fixed or replaced. Once you get familiar with the workings of your toilet you’ll see how easy it is to make these repairs. The remedy for a clogged drain isn’t always chemicals from the hardware store. In fact, those clean as can be very corrosive. A plunger will often get the job done. You can also buy your own hand crank drain snake for a quick attempt at unclogging a drain. Just note that a plunger for a sink is a different size of the plunger for a toilet. It’s a good idea to have both sizes on hand. The handyman skills mentioned above are very easy to take on. 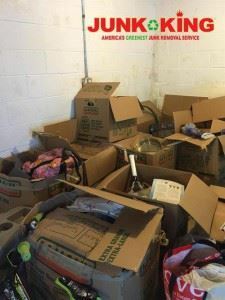 When it comes to a bigger job like hauling junk from your home that is something you might want to bring in professional help with. Junk King Miami is the perfect company for this type of work. They have a lot of experience removing all kinds of rubbish from homes and businesses. Whatever you want taken away will be quickly loaded by the crew assigned to your task. Don’t make junk hauling a DIY job. Turn that task over the Junk King Miami. You’ll be glad you did. This entry was posted in Miami Junk Removal and tagged clutter, handyman skills, junk removal on August 28, 2017 by Junk King. Last updated August 28, 2017 .